The main difference between wild and managed pollinators is that the number of wild pollinators is small in a particular area whereas the number of managed pollinators is high. However, the efficiency of wild pollinators is high on per visit basis while the efficiency of managed pollinators is low on per visit basis. Wild and managed pollinators are two types of pollinators important in crop pollination. 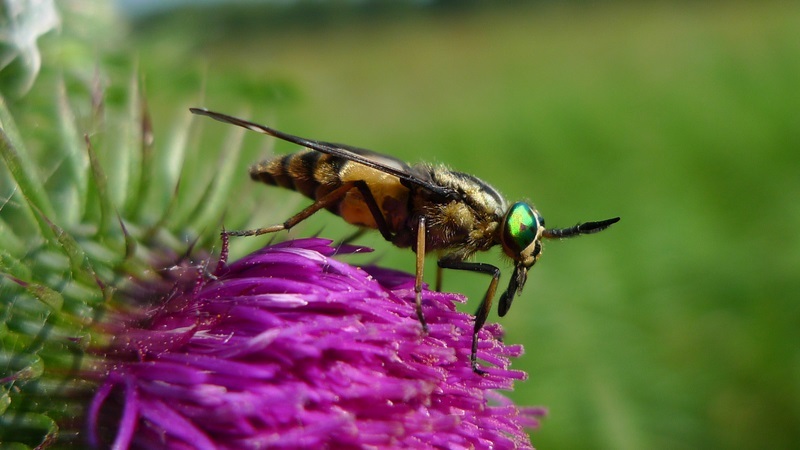 Most native species of insects including bees, wasps, flies, butterflies, moths, beetles, etc. are wild pollinators while managed pollinators include European honey bees, local bumblebees, blue orchard bees, etc. Wild pollinators are the species of animals and insects native to a particular area. They aid in the pollination of both agricultural and wild plants in that area. Moreover, they serve as the mediators of the movement of pollen from the anther to the stigma of the same flower or another flower of the same species. This facilitates the fertilization of the ovule by the sperm cells in the pollen. In fact, pollination is a type of symbiotic relationship whose reduction affects the survival of both. Furthermore, one-third of the world’s crop is pollinated by insect pollinators. However, chemicals associated with agriculture and loss of habitats can cause a reduction in the number of wild pollinators. Insect pollinators include solitary species of bees, ants, pollen wasps, flies like bee flies and hoverflies, butterflies, moths, and flower beetles. Around 20,000 bee species are involved in pollination. Animal pollinators mainly include bats and birds. Also, some non-bat mammals including monkeys, rodents, lemurs, possums, lizards, etc. are also responsible for pollination. Moreover, birds including honeyeaters, hummingbirds, and sunbirds with long beaks are important in pollinating the deep-throated flowers. Managed pollinators are elements of crop-associated biodiversity. Their main service or function is to improve the yield as well as the quality of the crop. The native species of pollinators or wild pollinators are very efficient in pollination when considering the per visit basis. However, their number is less in a particular area. Therefore, in order to increase the efficiency of pollination, managed pollinators are introduced into the agricultural fields. This increases the yield of the crops. In the meantime, this also increases the quality of the crops since pesticides are not used along with biological species. On the other hand, the pollination effectiveness of managed pollinators increases in the presence of wild pollinators. For instance, pollination management includes the management of pollinators, pollination conditions as well as pollinizers. Some traditional crops which get the benefits of managed pollination include apple, pears, cherry, blueberries, plum, cranberries, cucumbers, watermelon, almond, and the seeds of alfalfa and onion. The two main commercialized species of bees used in pollination management are blue orchard bees for fruit and nut trees and local bumblebees for other crops. European honey bee is another species that act as managed pollinators. Wild and managed pollinators are two types of pollinating agents important in crop pollination. Insects serve as both wild and managed pollinators. Wild pollinators refer to species of animals and insects native to a particular area, aiding in the pollination of both agricultural and wild plants. In contrast, managed pollinators refer to species of insects and animals that are used to manage pollination in crop associated biodiversity. Hence, this is the main difference between wild and managed pollinators. 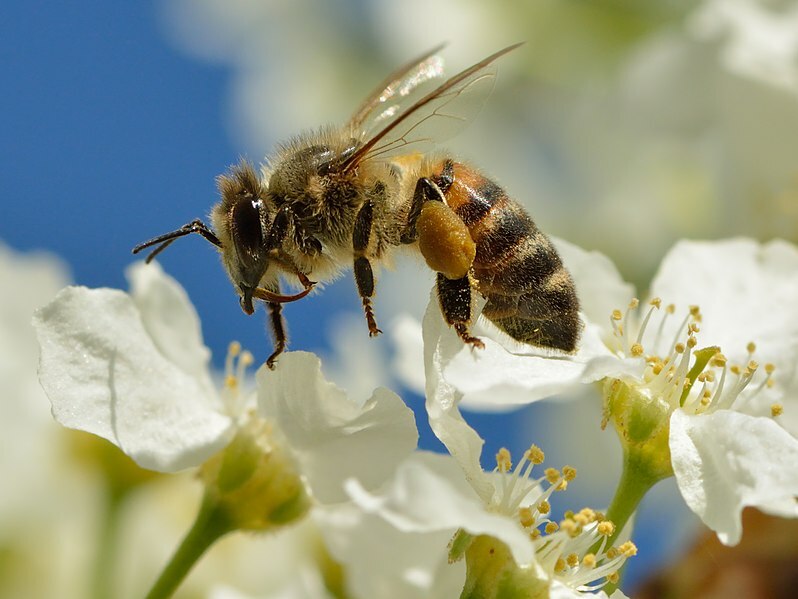 Wild pollinators include bees, wasps, flies, butterflies, moths, beetles, and animals while managed pollinators include European honey bees, local bumblebees, blue orchard bees, etc. Moreover, wild pollinators are a native species to the field while managed pollinators are introduced in large numbers to the field. Furthermore, efficiency on per visit basis is a major difference between wild and managed pollinators. The efficiency of the wild pollinators is high on per visit basis while the efficiency of the managed pollinators is low on per visit basis. 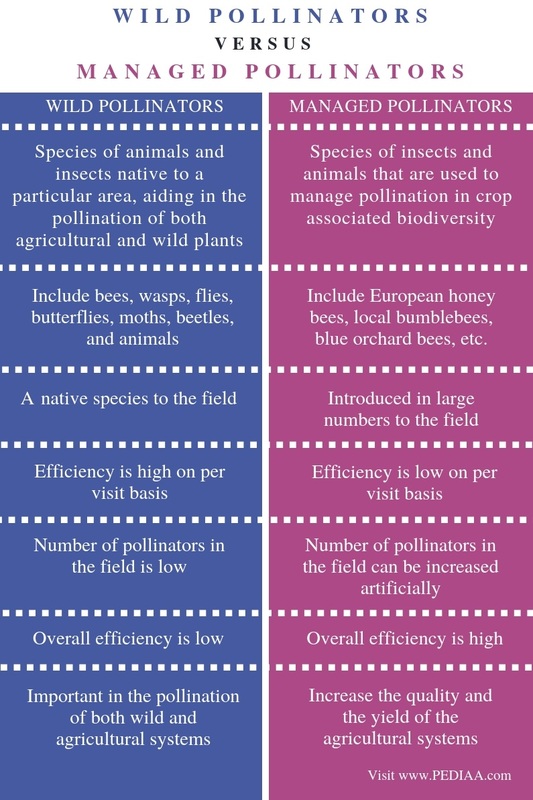 Also, the overall efficiency of wild pollinators is low while the overall efficiency of the managed pollinators is high. Thus, this is another difference between wild and managed pollinators. Besides, the number of wild pollinators in the field is low while it is possible to increase the number of managed pollinators in the field artificially. Yet another difference between wild and managed pollinators is that the wild pollinators are important in the pollination of both wild and agricultural systems while the managed pollinators increase the quality and the yield of the agricultural systems. Wild pollinators are a native species of the field and include animals and insects. They help in the pollination of both agricultural and wild plants. However, the overall efficiency of the wild pollinators is low. Meanwhile, managed pollinators are introduced in large numbers to increase the overall pollination efficiency. Therefore, the main difference between wild and managed pollinators is the overall efficiency of pollination.